American Fries are sometimes called Home Fries. I guess it just depends on when/where you were raised, but when I think of Home Fries I think chunky potatoes, not slices. So these American Fires are potato rounds cut and browned in a skillet. And they are delish! But starting with leftover potatoes, especially from Pot Roast makes American Fries that really fry up beautifully crunchy and delish. These American Fries make me love having leftover potatoes. My Baked Potato Hashbrowns do, too, but I usually think of that recipe when I have leftover baked potatoes and this particular recipe when I have potatoes leftover from Pot Roast. First of all, there’s already some flavor infused into the potatoes and American Fries are a great way to refashion those potatoes into something fantastic. And ya’ll probably know what I mean when I say once the Pot Roast is gone, and the potatoes linger on, no-one really wants to eat them. They’re sad. Sad and grey and cold and they’re just not that great. (Even if there is still gravy which usually makes everything better.) I’m guessing in a lot of households, leftover potatoes like this usually sit around in the fridge and then get tossed. What makes American Fries From Leftover Potatoes cook up so beautifully is that they’re twice baked just like the best fries are. The first bake, of course, is with the pot roast, the second in the skillet. Let me show you the two pot roasts I make most often with roasted potatoes that potentially generate a few leftovers for these beautiful, crunchy American Fries. There’s That OLd Lipton’s Onion Soup Pot Roast (oven or slow cooker) and Campbells Ultimate Pot Roast (instant pot or slow cooker). You can’t go wrong with either of those super simple recipes! This “recipe” is so simple it’s not even really a recipe! Just cut the potatoes into about 1/4 to 3/8″ slices. Add oil to skillet and then the potatoes in a single layer. You might want to use a large skillet or maybe two or pull out the ol’ electric skillet like my Mom used to do. Make sure the oil is good and hot before adding the potatoes and turn only once. If you have more people than your leftover potatoes will feed, try microwaving a few potatoes, then let them cool, peel if you want and add them to the potatoes you do have. Or maybe you don’t have any leftover potatoes to make American Fries From Leftover Potatoes! Don’t feel sad. Just make as many potatoes as you need in the microwave or oven, then make your American Fries. Making your American Fries from leftover potatoes not only makes gorgeous American Fries with a fantastic crispy crust, but it’s also a huge time saver over making American Fries from raw potatoes. These potatoes look like they’ve seen better days – but just wait! Larger bags are often a mix of different sizes. I go through the bag and set aside the larger uniform ones for baking and then use the mixed sizes and shapes in recipes like soup, pot roast, mashed potatoes or any recipe where a uniform size doesn’t matter. Store your potatoes in a loosely closed bag away from any onions and in a cool place. It’s not unusual to see them next to my back kitchen door in the fall and winter, but in my small kitchen, I have to be creative! Heat a skillet or griddle over medium-high heat. When hot, add oil and then the potato slices in a single layer. Cook until browned (may cook unevenly, keep checking individual potato slices) then turn and brown the second size, turning only once. Turn only once. Salt and pepper as soon as removed from the skillet and serve immediately. If you have a favorite spice rub or blend, feel free to sprinkle that on the potatoes before or after cooking. I’ll be sharing my American Fries From Leftover Potatoes at Fiesta Friday #243, hosted this week by Catherine @ Kunstkitchen’s Blog and Becky @ Bubbly Bee. This entry was posted in Click here for Fabulous Food Posts and tagged hearty sides, leftover potatoes, Potatoes, Side. Bookmark the permalink. 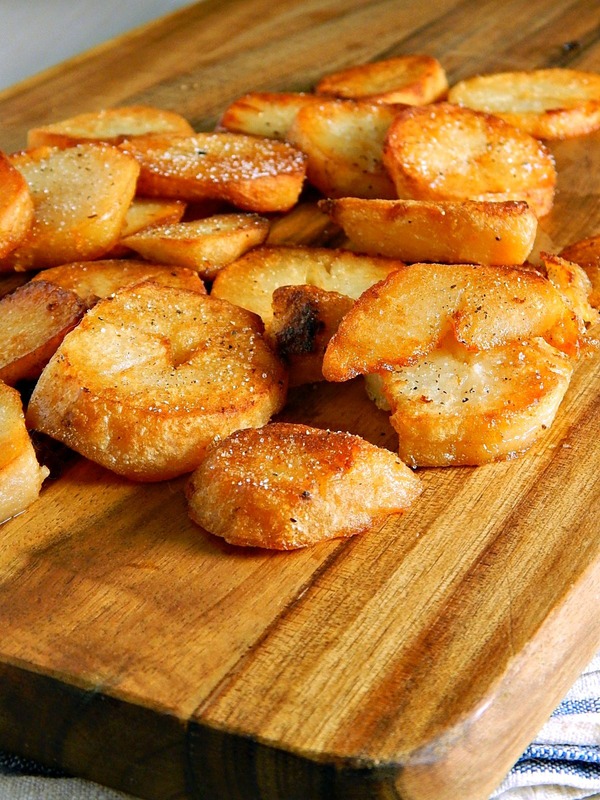 Fried potatoes are my idea of heaven and your potatoes look heavenly! Thank you for sharing on Fiesta Friday! You can’t go wrong with these! Happy FF, Becky! I am only just now getting used to runny eggs – I developed an aversion during my pregnancy with my daughter in 1985! I was so sick duriing that whole time & to put it delicately, they aren’t pretty on their return trip! I think blogging helped because there are times I want to and have put poached eggs on stuff! So maybe next time I make these for breakfast I will try it with a runny egg! When we would camp on the lake we would always make extra campfire baked potatoes so we could have pan fried potatoes with breakfast the next morning. Always fried up in bacon grease leftover from frying trout the night before. Now, I need to go fishing and cook some potatoes. Don’t you love a runny egg on top of those bad boys? They look delicious and so do those plates of pot roast! I have to ask, what are Porcupine Balls? Thanks much, and you are probably lucky NOT to know lol! They’re not so bad, probably for an adult but as a child I was never happy when Mom made them. It’s rice and hamburger made into a meatball and they’re usually cooked in a kind of soupy tomato sauce.As they cook the rice swells and sticks out of the meatballs, so they named after the way a porcupine sticks out it’s quills. Luckily they are not made OUT of porcupines, which someone might think if they’ve never heard of them! Actually looks kind of good! I didn’t realize you had so many siblings! But then with a lot of large families, sometimes the older ones get out pretty fast! I always wanted a big family and it’s always been sad for me that I only had two children! Great idea Mollie!! They look so crispy and golden. We had an electric skillet growing up and yes– porcupine meatballs!! All that crunchy (?) rice! It was a whole different world of cooking back then. I wonder what my kids would be saying about our old meals??! Anyway, the fries look pretty irresistible! I know right!! Mostly I remember it was the same things over and over, at least when I was young. I think by the 70’s people were breaking out a bit more but can you imagine cooking without the internet! lol! For my mom it was Meta Given’s Encyclopedia of Modern Cooking! From the 50’s. We had roast, sloppy joes, chili, hot dogs wrapped in bacon, porcupine balls, something worse they called Candy Balls, which were like Asian porcupine balls, meat loaf, stew, the Chicken cooked in a casserole over rice mixed with Cream of Mushroom Soup, Oxtail Soup, Pork Chops baked with Cream of Mushroom Soup. Meatloaf. Swiss Steak. Stuffed Peppers. Hamburgers. Lots of heavy Germanic & farm influences and lots of meat, I think! Sounds familiar Mollie. My Mom’s family was from South Dakota. And there was plenty of cram of mushroom soup! But we ate home every evening and sat around the table. Thankful for that. hugs! It would not be right to count it, lol! Besides those are British calories and must be different, lol! It’s kind of funny but I have been thinking about hot dogs recently, good ones! I don’t have any hot dogs on my blog but I’ve been wanting the ones my mom used to make, sliced and filled with cheese then wrapped in bacon and grilled! OK that sounds like heaven! We’re getting goose fat and duck fat comments, makes me think of that old game duck duck goose! They’re a favorite here, but I don’t always think of them. I am an absolute fan of crispy potatoes. It’s a weakness. These look so good. Leftover potatoes make such a great start! My mom used to make these with leftover potatoes for breakfast, delicious! They were always a treat. Delicious! Oh these would be so good for breakfast!